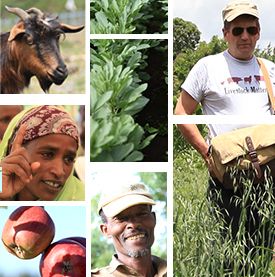 The Africa RISING project in the Ethiopian highlands focuses on action research and is being implemented by different CGIAR centers and local partner institutions. To bring the research closer to the ground the involvement of farmer research group is seen as critical. To this end a field visit was organized in Sinana in June 2014 to identify farmer research groups for crop and livestock related action research protocols. The project team was able to identify farmers that will participate in different research groups. This photo report visually presents the process taken to select the farmers research group. Tags: Sinana. Bookmark the permalink.